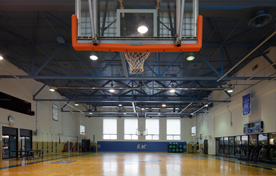 Practice your three-pointers and layup shots on the indoor basketball court at Ellis Athletic Center in Newtown Square. That’s not all you can do in our excellent full-court gym, though; our indoor court is ideal activities such as pickleball, volleyball, dodgeball, ping pong, and even group training classes. You can pick up a game of basketball or other activity during our fitness center hours, subject to rental and class schedules. Our indoor court is just one part of our terrific athletic facility; be sure to check out our outdoor fitness areas and our in-gym juice bar, too! Did you know that our basketball court is available for rent? Along with the rest of our facility, you can rent our basketball court for your next corporate, youth, small group, or church event. It’s a great space that offers plenty of flexibility, whether you need a place to get active or just want a comfortable space for easy activities with your team. Check out our basketball court rental schedule to see if our space is available for your next event. Ask about hosting your league or team practices or find out more about our numerous group exercise classes. Our team is happy to help ensure your event is a success. Call our Newtown Square health club at (484) 200-7774 to speak to a member of our team.